Go water skiing in PA at one of these great locations! Find waterskiing in Pennsylvania that will fit your outdoor adventure needs. Water Ski with No Horsepower Limit! Conneaut Lake, Pennsylvania's largest natural lake, is perfect for those who want to go water skiing in PA! Water sports enthusiasts will find this resort area great for boating, fishing water skiing, jet skiing, wake boarding, paddle boating and swimming. A wonderful place for an active getaway, there are also many attractions near the lake including Conneaut Cellars Winery, Whispering Pines Golf Course, and Conneaut Lake Park - home to the wooden roller coaster "Blue Streak." For a weekend getaway or a longer vacation, several campgrounds are next to the lake. 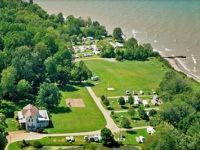 Check out Brookdale Campground, Camperland at Conneaut Lake Park and Runamuck Campgrounds! Create memories that will last forever! Lodge and Have a Water Skiing Weekend! 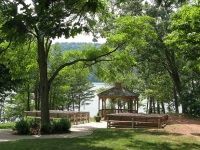 For a great lakeside getaway, check out Lake Raystown Resort! With tons of fun outdoor activities you'll find yourself busy from dawn til dusk. This beautiful lake, located in Huntingdon county, is perfect for swimming, boating, beach activities, and water skiing! Pontoon boat rentals include water skis or a water tube. Choose from 60 or 90 horsepower pontoon boat and enjoy the thrill as you skim above the surface of the lake! PA water skiing has never been so fun! Other resort attractions include mini golf, geocaching and WildRiver Waterpark. Stay for a weekend, or a week - lodging is available year round! Water Ski in a PA State Park! This gorgeous state park is an ideal place to go waterskiing in Pennsylvania! 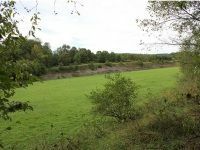 Located in Carbon county, this park surrounds Beltzville lake which is great for swimming boating, fishing and water skiing! The lake has a designated area just for water skiing to ensure that nobody gets in your way as you fly across the surface of the lake. Two boat launching ramps are available for you to get your boat into the water. Other park activities include hunting, hiking, biking, and picnicking in their picturesque picnic areas. Open year round, this park also has several winter activities including ice fishing and cross-country skiing. Water Ski on One of the Great Lakes! This huge lake, located in Erie Pennsylvania, is the perfect place to water ski with no limits! Bring your boat and skis and use one of the many water ramps available to launch your boat. A great place for swimming, fishing and beach hiking as well, this lake is known as Pennsylvania's only "seashore." With a sunset rated among the best in the world by National Geographic the scenery on and around the lake is sure to delight! Located near state parks, theme parks, and only 1 1/2 hours away from Niagara Falls, this is a great place to spend a weekend or vacation! One of the Most Scenic Water Skiing Destinations in PA! If you're looking for water skiing in Pennsylvania, look no further than Indian Lake Resort! Newly renovated in 2011, this woodland resort has a rustic charm that's hard to beat. Its location on Indian Lake, makes it convenient for water sports enthusiasts to enjoy days of fun! Bring your own boat and water skis and thrill to the feeling of gliding across the lake on your skis! 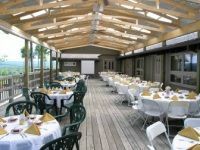 Indian Lake Resort offers dining in the scenic Arrowhead Restaurant which has wonderful lake views, and cocktails and drinks in the Tomohawk Lounge or the WigWam Pub, all located on the resort grounds. Area attractions include a buffalo farm, golfing, hiking trails, and Idlewild amusement park!